After the Marlene Dumas exhibition has left the Stedelijk Museum Amsterdam mid-January, a gallery in the collection display of the museum will be dedicated to the work of Marinus Boezem. Boezem was one of the organizers of the groundbreaking exhibition 'Op Losse Schroeven. Situaties and Cryptostructuren' which took place at the museum in 1969 and was crucial for the development of conceptual art in the Netherlands and abroad. 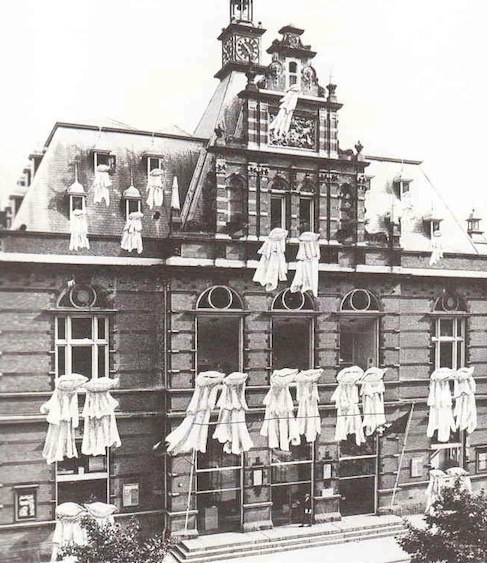 For this exhibition, Boezem had bedsheets hung out of all the windows of the museum's facade, to erase the border between the museum and the public space. He was also one of the first artists to exhibit something immaterial: the weather. He had the daily weather drawings from the newspaper projected in the museum galleries and the voice of a newscaster could continuially be heard reading that day's weather forecast. These and other works were acquired by the Stedelijk Museum in 2012 and will be part of the semi-permanent collection display. The Absence of the Artist, Boezem's solo show at Upstream Gallery, is on view until the 17th of January.